Comments and discussions are flying around everywhere regarding the release of Harper Lee’s long lost manuscript. One of America’s most cherished literary characters, Atticus Finch is now seen in a different light. The image so indelibly imprinted in our minds is the elegant and thoughtful Gregory Peck, sitting on the porch in a rocking chair, portraying the southern gentleman as a kind and intelligent father. 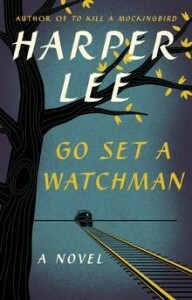 In Go Set a Watchman, we may begin reading with that image in mind, but it fades within the first few pages. Another man begins to emerge: thoughtful, yes, judicious, yes, elegant- maybe not so much. What we do see is a very real portrait of a man seen not through the eyes of a young girl, but as a fully fleshed human being, caught up in the changing times. It is surprising to see him clinging to old ways of thinking, and it is slightly horrifying to our modern sensibility. Advance copies given to members of the press yielded the news that our beloved Atticus Finch was a racist. Having traveled in Jim Crow’s south in my youth, I have a picture of what life looked like back then. We took frequent train trips from Toronto down to Florida. You had the white south and the “colored” south, clearly divided. It was as if each place had two different cultures, living side by side, but with one having the best of everything and the other, out on the fringes. You would see blacks lining up for the bus in maids uniforms, or in overalls with mechanics rags in the back pocket, but rarely in any other roles. One clearly served the other, and for the most part relationships seemed to be jovial. The courtesy delivered on both sides of the great divide was clearly evident to me. Somehow I got the idea, probably from my grandmother, and mother and father that the whole subject was off limits and in polite society, the great divide was not discussed. Efforts should be made to be extra courteous at all times, given the difficulties of the whole history and structure. That is the very crux of the matter that Scout attacks in Go Set a Watchman. Having lived in New York and returning to her hometown, she is no longer willing to hush up. Going back to what I learned from my parents was more in keeping with the Finch household that Scout thought was the one in which she lived. Every chance should be given to helping people improve their lives. I was never given the impression that intelligence, or certainly athletic ability was in any way inferior. It was more that time and circumstance had created this unfortunate situation, and that change was inevitable. So reading Go Set a Watchman had me pulling for the grown- up Scout to whom I felt so endeared. Harper Lee has an astonishing voice. Not publishing this novel had nothing to do with Lee’s talent as a writer; it had everything to do with its content. What I came away with is an understanding of the craft of writing a novel. Any writer has freely flowing ideas, and things he or she wants to say. Issues, statements, and a desire to create change can keep many a person typing away late into the night. She found the characters, she found her voice, she ripped the scab off polite society in the south and exposed a great deal of fear and ignorance. The story that became To Kill a Mockingbird is embedded here. You see that she did get to have her say, but in a totally different way. I found I was in awe of her editor. Why Lee did not continue writing more books is a mystery. How she had the courage to begin again after hearing she needed to go back to the drawing board is a great testament to her character. Any writer who reads this may well fish out those buried manuscripts and look at them in a new light. Is there one aspect that can be salvaged? What drew me to the character in the first place, and how do I focus on that more fully? Go Set a Watchman may detail a very universal experience in the lives of young women. There is the father you saw at nine, the man with the answers, the work ethic, the discipline and the good judgment versus the flawed human being you confronted later in life. The girls who went from climbing trees and playing with the neighborhood boys to the teen who was criticized every single day in order to make a lady of her often do have something to say. I loved Lee’s brashness, her intelligent voice, her saucy wit and her guts to challenge the archaic social mores. With events in Charleston unfolding as they have in the last while, perhaps this long- buried story has emerged at just the right time. This entry was posted in Uncategorized on July 20, 2015 by Elizabeth Smythe Brinton.